You can support Art is Ageless® and arts programming in local PMMA communities by making an online gift today with our secure online donation form below. Through the Art is Ageless® experience, PMMA offers seniors a variety of artistic classes and programs. Many communities bring in local professional artists to work with residents. Other classes are started by residents and employees. Residents are encouraged to express their creativity, in whatever form it takes. 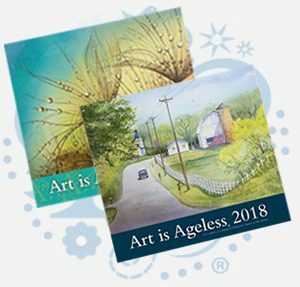 To purchase the 2019 Art is Ageless calendar, please call Caren Remmers at 316-685-1100, or contact us. Calendars are $10 each and all proceeds benefit the Art is Ageless program. You can leave an online gift of $10 for the calendar. Please contact Caren Remmers to receive the calendar by mail.